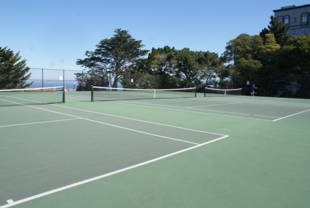 Part of George Sterling Park, the Alice Marble courts feature four tennis courts in good condition and a backboard. There is also a full basketball court! There are plenty of benches along the courts for cooling off or for waiting. 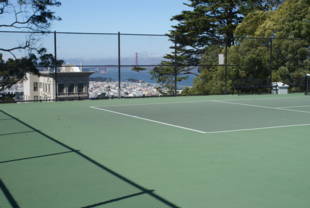 The Alice Marble Tennis Courts are owned by the San Francisco Recreation and Park Department. Courts with a view! 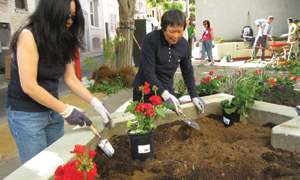 The Golden Gate Bridge is visible and the city seems to spread out from beneath your feet. 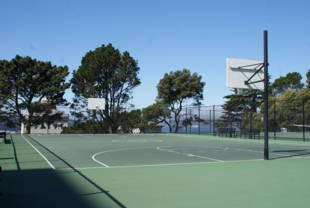 These tennis and basketball courts (named for famed California tennis champion Alice Marble) have recently been rebuilt as part of the San Francisco Public Utility Commission's (SFPUC) replacement of the reservoir beneath them.